I had heard a lot of hype about this poker room for quite some time so I finally had to check it out and it really does live up to much of the hype. Most big online poker rooms have solid game play, but are lacking in the overall experience. Sites like FullTilt have a nice interface, but beyond some slick avatars and nice looking table layouts, don't have much interactivity. PKR does a great job of bringing players deeper into the game. You can completely customize your player, you can make expressions at the table to give tells (or fake tells) and can even do tricks like shuffling the chips. The environment is like playing Playstation poker, but with real money and real players online. This room is definitely worth a try for the interface alone. 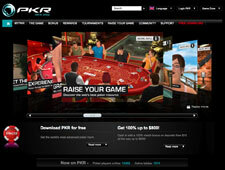 Write a PKR Review and share your thoughts with other players.